The police of Nepal is responsible for maintaining law and order and prevention of crime according to the constitution of Nepal and is under the authority of the Ministry of Home Affairs. Sarbendra Khanal is the current IGP of Nepal Police. Traffic Police in Kathmandu is challenging for the officers due to high pollution in the city. The Police institution dates back to the ancient times as does the history and language of the country. During Rana Regime, little was done to institutionalize the Police Organisation, establishing Milisiya, Thana police Chakki, office of Police director general etc. which gradually shaped The Nepal Police to this modern "Nepal Police". Nepal saw the dawn of democracy after the fall of the Rana regime. The Police Headquarters was established in 1952 in Kathmandu. Mr. Toran Shamsher J.B.Rana was appointed the first Inspector General of Police. The Police Act, 2012 BS (1955 AD) came into effect. The Police Regulation, 2015 BS (1959 AD) came into effect. The Parliamentary Government under the multi-party system was adopted for some years which was followed by Panchayat System since 1960. The establishment of the Central Police Training Centre in 1963 A.D. The Peoples democratic movement of 1990 reinstated the multi party democratic system. The new constitution of the kingdom was promulgated on November 9, 1991. The Police Reform Commission was constituted in the year 1992 and Modernization of the Police Organisation started to tune with the aspirations of the people and norms of Multi-Party system. The first contingent of Police personnel was deployed in UN Mission in 1991. More than 2000 police personnel have already left their feet serving the international community in blue helmet. Nepal Police is the main and principal law enforcement agency of Nepal. 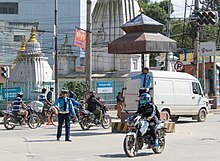 Nepal Police has total 67,416 police personnel and has 2,344 permanent and 507 temporary police offices and units spread all over the country. The present chief of Nepal Police is Sarbendra Khanal. The Nepalese Police is headed by the Inspector General of Police of Nepal. He reports directly to the Ministry of Home Affairs and is appointed by the Government of Nepal for a tenure of four years, although two IGPs have served for six years. There are four departments in the Police Headquarters that function to undertake the policing activities of Nepal Police. These departments are headed either by Additional Inspector General of Police (AIGP) or Deputy Inspector General of Police (DIGP). In addition to the departments, there are the National Police Academy and the Metropolitan Police Office that are being looked by Additional Inspector General of Police. To conduct foundation training's (induction courses) by offering developmental opportunities to the senior police officers and technical police officers. To prepare police instructors required for the entire police training system in Nepal Police and provide consultancy services. To offer and undertake advanced training for senior police officers in the field of leadership, management and administration, proactive policing, community policing trainer's training, etc. To extend prospective and substantive relationship with universities in the relevant subjects and to award academic degrees to the trainees. To organize workshops, seminars, symposiums, conferences and short courses in policing issues. To carry out quality research activities (required by Police Headquarters-PHQ) or to act as a research faculty (qualitative research on behalf of PHQ) regarding police profession to develop analytically capability. To extend assistance and advice police headquarters i.e. consultancy service rendered to PHQ in formulating training policies. Nepal Police has started using Polygraph system for credibility assessment in criminal and internal disciplinary investigations from 6 February 2014. Nepal Police has established "Central Polygraph Section" in Crime Investigation Department at Police Headquarters. Research and Planning (R&P)Directorate of Nepal Police was established in 1987 as the research and planning division. Now, the R&P Directorate is responsible for conducting research on the issues of institutional development and service delivery and making the plans based on the findings of the research. The directorate is responsible for conducting research and formulating plans based on the research. Altogether 17 Research and planning sections have been established at departmental and regional levels under R&P Directorate to build a quick network to facilitate research and planning activities of Nepal police. Uniform of the Nepal Police consists of summer and winter gear. Regular officers wear a light blue shirt with navy blue pants. Junior ranks wear beret while high-ranked officers wear Peaked cap (with a blue band) with most senior officers with braids on the peak. Riot police (Special Task Force Police) wear blue DPM pattern camouflage uniforms will ball cap. Winter uniform adds a blue jacket or sweater. ^ "Prakash Aryal picked as new Nepal Police chief". Tha kathmandu Post. Retrieved 12 April 2017. ^ "About IGP". Nepal Police. Retrieved 10 October 2017. ^ "Exclusion illusions". República. Retrieved 10 October 2017. ^ "Metropolitan Traffic Police Division".